Gainesville Hotel's Location "Almost on Campus" at UF The Holiday Inn Gainesville University Center hotel is surrounded by local shops, restaurants, boutiques and the University of Florida. The hotel sits in the heart of Gainesville, allowing easy access to downtown Gainesville, including The Hippodrome Theater, Gainesville Regional Airport and The University of Florida and its athletic facilities. Hotel guests visiting Gainesville for Gators sporting events are happy to find Ben Hill Griffin Stadium, or "The Swamp," just blocks from the hotel's location. While in Gainesville, FL, patrons don't want to miss on-campus highlights like the Harn Museum of Art and Florida Museum of Natural History, either. Stay here and enjoy easy access to all the best attractions in Gainesville. The hotel's corporate guests also find the hotel well suited for business. Free Wi-Fi access is offered throughout the facility, and a 24-hour Business Center is available for your print, fax, copy and PC needs. And, if you're hosting a meeting while in Gainesville, you can consider our on-site events facility, which features 540 square feet of space. 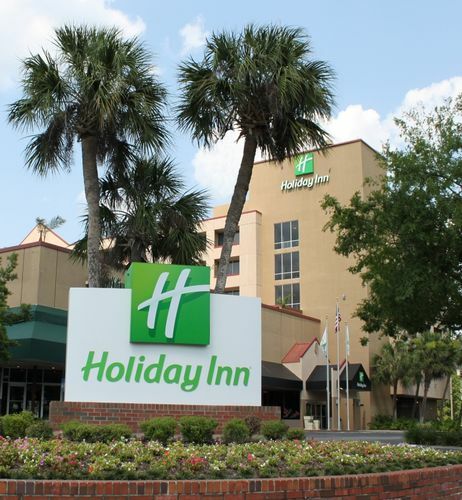 Discover the genuine value of this Holiday Inn Gainesville hotel. Take time to unwind in the 14,000-sq-ft rooftop pool area, or work out according to your schedule in the 24-hour Fitness Center. Book your Florida trip today!